It’s a while since I’ve written up a trip on Alfie. This is partly because I’ve been using Penelope more but also because a lot of my Alfie trips have been as part of my Churches in Kreis Viersen challenge and so I haven’t written them up separately. 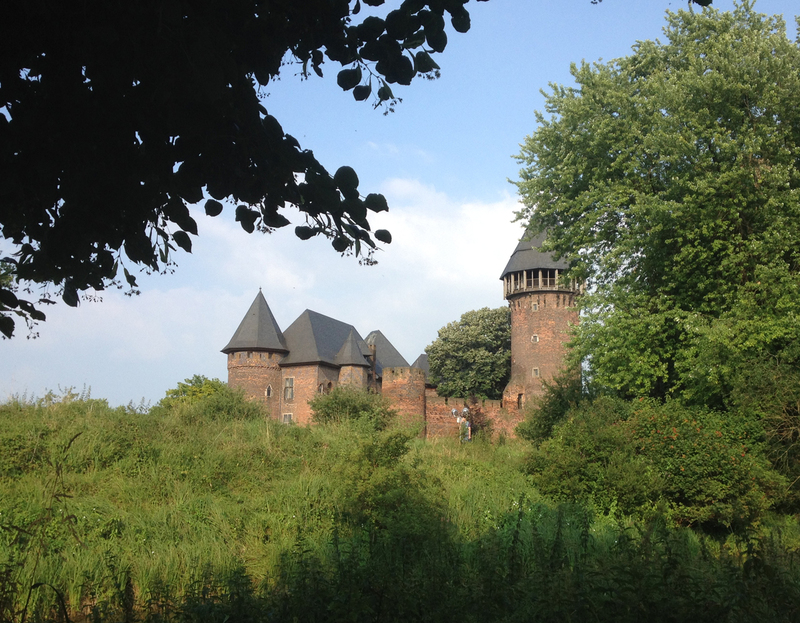 Today I decided that I would write a short blog post about Alfie’s trip to Burg Linn in Krefeld. Krefeld is about eight miles from my home in St Hubert so that seemed a bit too near so instead of just riding there from home I put Alfie in the car and drove him 15 miles away. 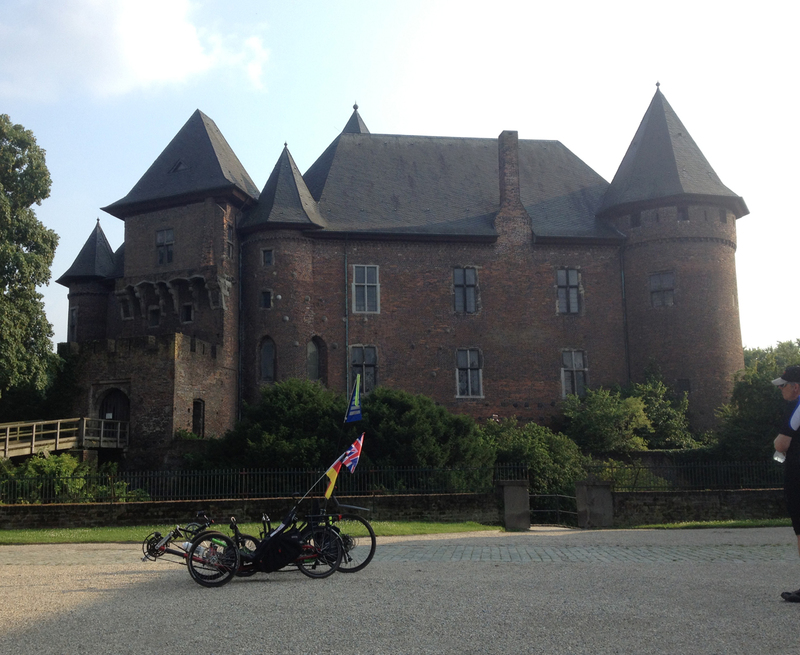 This time I would not be riding alone, I would be guided on my route by Klaus, who cycles on a Steintrikes Wild One recumbent trike. (I shall mention here that Klaus has written a blog post – in German – about our ride last week which involved a nice downhill. If you want to read it then his blog is here, and it has a Google Translate option built in which does make for some rather amusing reading as it’s pretty inaccurate in places). 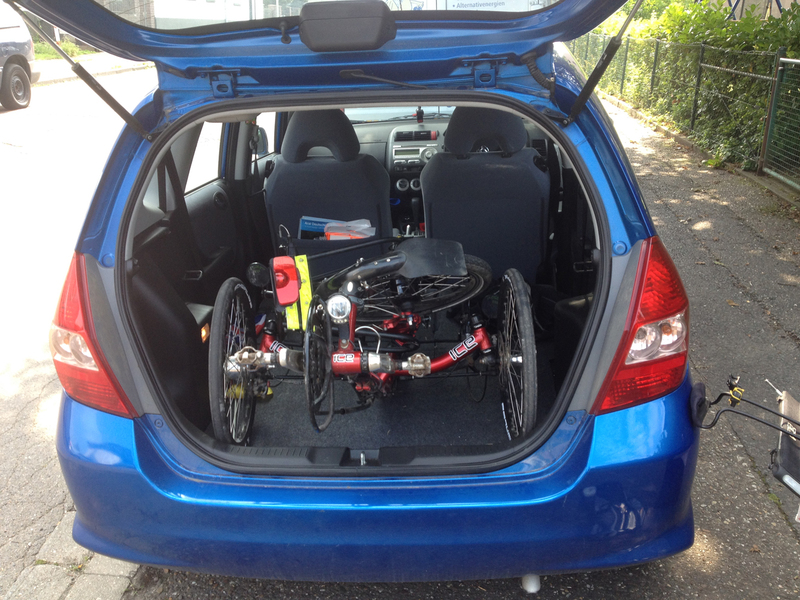 Klaus lives in Viersen so I arrived and opened the boot of the car to let Alfie out. I lifted him out and then unfolded him and discovered something wasn’t quite right – the chain tube had come adrift from the idler and a bit of double-sided velcro that holds the whole lot to the general hinge area had also come off. I had got some help to lift Alfie into the car so I guess the helper grabbed onto the wrong bit. I had the mucky (back) end for that procedure and ended up with oil all over my arm. Anyway, I wheeled Alfie to Klaus’s front door and then started to effect my repairs with a bit of help from the tame engineer. Fixing the chain tube back into the idler just required me to get oily hands and Klaus was able to reattach the velcro thingie (although it came undone later, although didn’t seem to be too much of a problem). 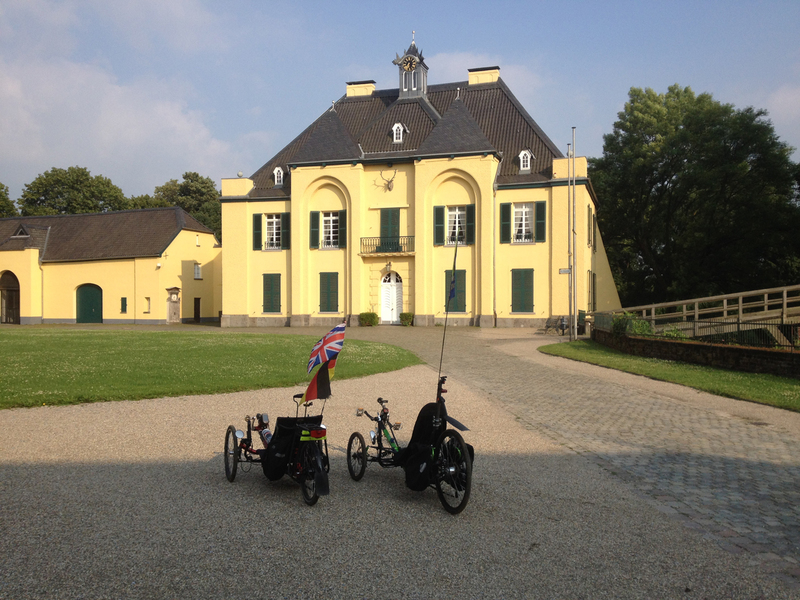 Klaus had prepared a route for us to take to Burg Linn which included a pretty direct route back through Krefeld. 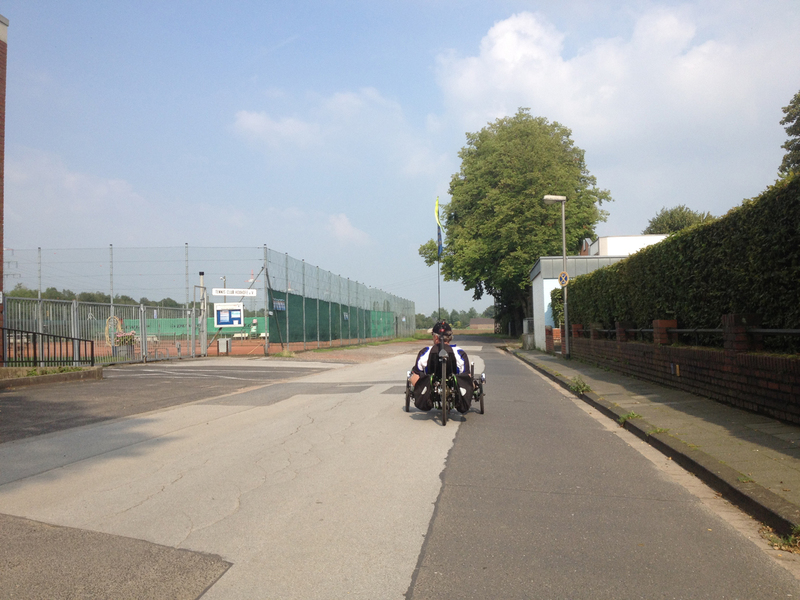 This was partly to save time as there was a lively electric storm forecasted and we wanted to get back before then – the flags on the trikes can be rather effective lightning conductors! 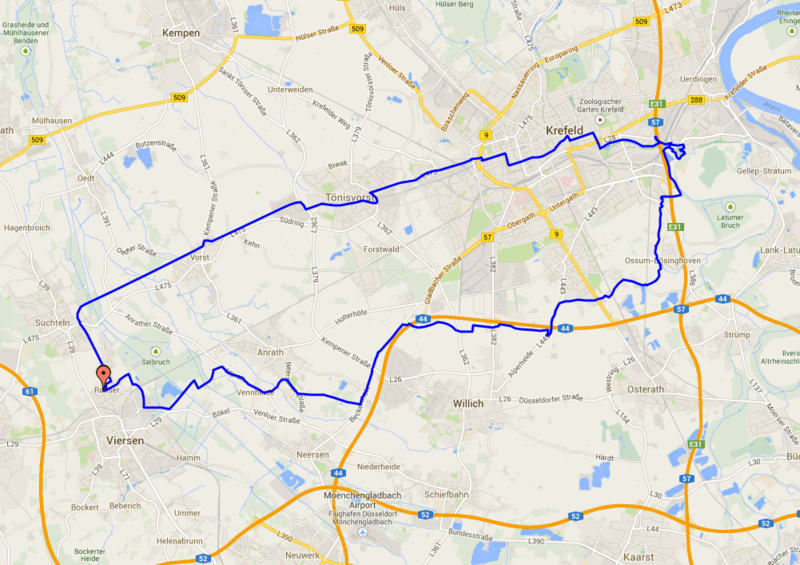 This is the route that we rode, doing the southerly section on the way to Krefeld. We started off wiggling our way to the south of Anrath but actually came upon a bit of a traffic jam at one point with other cyclists. Klaus is more polite than me and waited behind them for a bit; I would usually ring my bell and try to get past quickly. We continued on, with Klaus leading the way most of the time on these familiar routes for him. The poor chap is getting used to me saying “I can see a church on my Garmin that I haven’t visited” and lo and behold one appeared on the bike satnav screen so I twisted his arm to take a photo of me outside the church to the north of Willich (more about this church on the other blog pages of course). I was desperately hoping no-one would suddenly start ringing those bells whilst I was under them. We continued on in what was very weird weather – hot and sultry, following some huge rainstorms the day before. I learned a new German word – schwül – which means humid, muggy, sticky and is not to be confused with schwul which means gay. It becomes clear that I can’t properly hear the difference between the ü and u (which may explain why I am rubbish at saying Süchtelner Höhen) so I might have to avoid discussions about the weather or sexuality to prevent confusion. 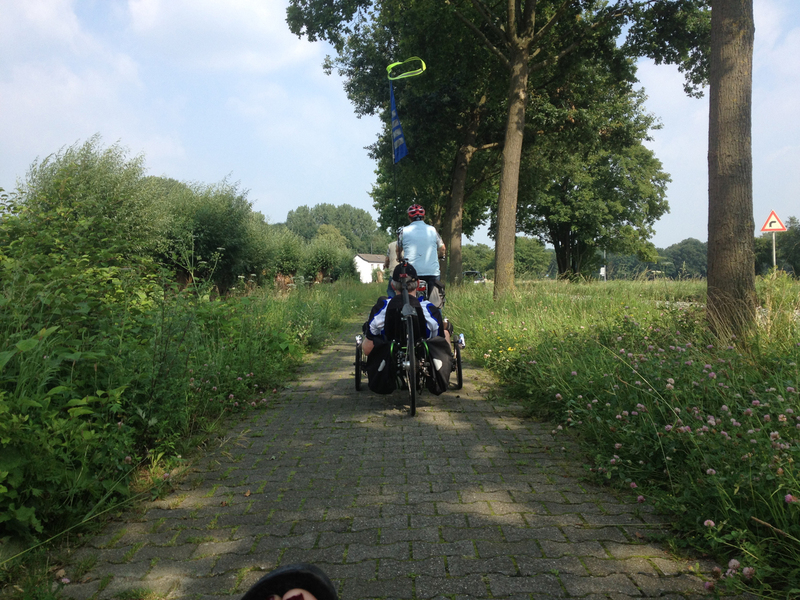 This section of the ride, skirting Willich and then going through the outskirts of Krefeld, was less scenic than some of our other rides but had the advantage of fewer mosquitoes! It didn’t seem long (although was about 30km) before Burg Linn became visible in the distance. It’s a large castle that was built by/for some duke (Klaus’s tour guide skills need a bit of brushing up as he was very vague about it all) and looks very impressive. However before we got there we had a sudden stop along a path to chat to a chap and his dog. After we’d chatted a bit to this chap (whose name escapes me) we carried on round to Burg Linn. It’s a really impressive place with a lake and moat and probably only a mile or so from the Rhein. Here is Alfie and the Wild One (as yet unnamed) outside. Alfie is wearing a German flag today (as well as the Union Jack) in honour of the German World Cup football team who are playing in the final this Sunday. We were parked in a little open courtyard place with interesting buildings all around. After spending five minutes off the trikes it was time to get going again to beat the storm. Our route back was going to be through Krefeld which isn’t the nicest of cities but we started off along a grassy path beside the tram which was quite good, although we’d taken a couple of wrong turns to get there. Klaus’s app does occasional rerouting when you’re not expecting it and I was distracted by some men in uniform (Policemen) by the side of the road so wasn’t paying attention to my Garmin. We went almost through the centre of Krefeld, eventually heading out on a faster road which heads towards St Tönis. I was a bit lost but was following Klaus’s wheel as he seemed to know where he was going. I have learned not to let him get out of sight else I get lost so the ride was a good workout for me as he rides ever so slightly faster than me normally. On our rides together I double my calorie burn, and as he seems to have an incomprehensible inability to stop at bakeries/cafés I don’t get to eat any of them back either! Mind you, most bakeries are shut in the evening so I suppose I will let him off a bit. We soon arrived in St Tönis (also called Tönisvorst on the map) and proceeded to join the Schluff (a railway cycle path) which I hadn’t previously discovered, despite cycling to St Tönis several times. This railway goes parallel with the main road to Vorst and then on to Süchteln-Hagen. It’s generally very decent and smooth asphalt although a bit narrower than some of the cycle paths so we cycled one behind the other. 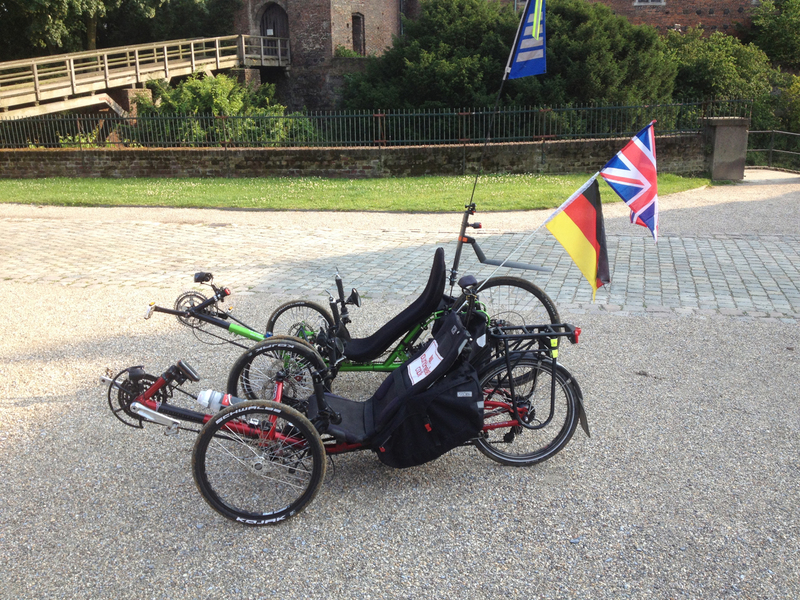 You don’t get any drafting benefit with recumbent trikes, unfortunately. 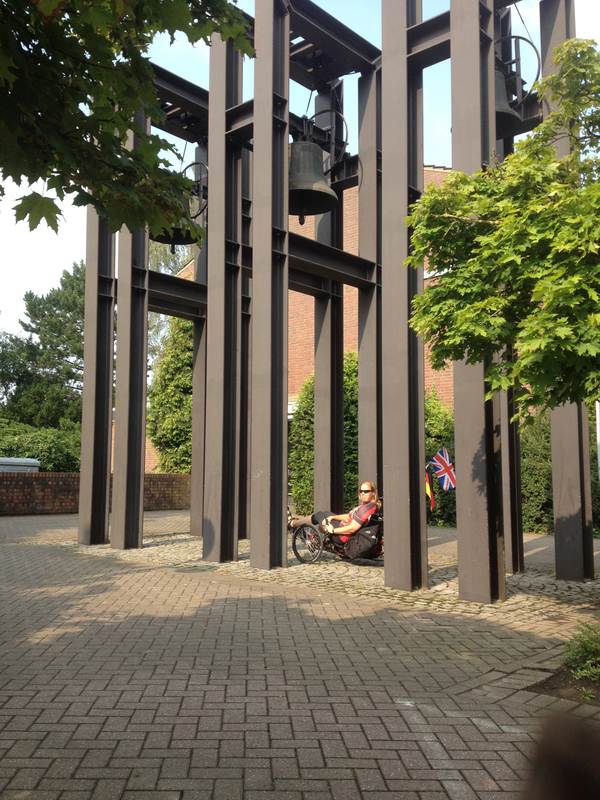 As we approached Hagen we spotted a lady cycling the other way – it was Camilla, the lady with the little dog who is Klaus’s neighbour and who I seem to keep seeing whenever I am cycling within 10km of Viersen. Random! The clouds were looking a bit fierce so we sped up a bit for the last 8km, so I was definitely working quite hard to keep up. Also when Klaus gets to within about 5km from his home he gets some kind of homing speed boost and disappears off into the distance. I managed to hang on but probably only because I ate a whole packet of peanut M&Ms yesterday whilst working. The last bit of this ride was on the now familiar Nordkanal Cycle Route which is one to probably try to do in its entirely someday (it’s 100+ km and goes to the Netherlands, although it’s not all asphalted). This little section, which goes from Viersen to Grefrath, is well done, though, with a good surface and not that many road crossings. We arrived back before the storm started which was a relief and my trike went back into the car OK, although the velcro chain-tube holding thingie had come undone again. It obviously isn’t too vital – I shall try to effect a repair with cable ties in due course (or will ask ICE to send me another). The statistics for the ride were interesting. The bottom two lines on this screenshot from Ascent are our two rides – mine is the top one (2 hours 48 minutes), Klaus’s is the bottom one (2 hours 46). He has a better GPS distance logger, I believe, but the barometric pressure altimeter on my Garmin is generally thought to be more accurate (as far as I know), and gives half the climbing figure that he has. We think the calories figure from his iPhone App isn’t actual calories (but something else) as it’s always ridiculously low. Anyway it was a good ride, not somewhere I would probably have visited on my own as I’m not too keen on riding alone in Krefeld in the evening. It’s always great to ride with company, even if Klaus hasn’t yet realised the importance of tea and cake stops on a 50km ride. 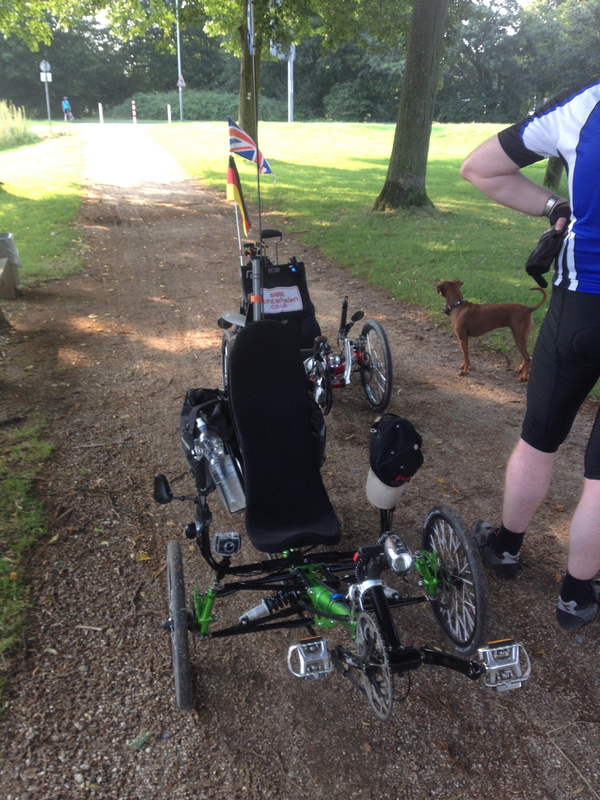 This ride also bought Alfie to the grand total mileage of 19,954 miles so if I take him on my ride tomorrow to Waldniel he might cross the 20,000 mile marker (in just over three years). Except the weather forecast is looking like rain and storms again so it’s probably a Penelope day. Klaus has also now written up this ride on his blog and it is available in German (with a Google Translate English option) here. thanks for this nice report. Next time we will stop for a cake or something else…promissed. I have the feeling that Helen might see that totally different….I have lost her twice, during one trip 😉 I have decided to send her the track in advance. This is not changing my behaviour but she has a better chance to follow.